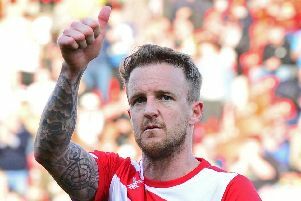 Herbie Kane scored one of the best goals ever seen at the Keepmoat Stadium to help Doncaster Rovers beat top six rivals Blackpool. The on-loan Liverpool midfielder's blockbuster strike in first half stoppage time was worth the admission fee alone and it set Rovers on their way to an important win against an in-form and well organised Tangerines outfit. Blackpool arrived in Doncaster on the back of five successive wins and arguably had the better of the first half as they stopped Grant McCann's men getting into their stride and occasionally threatened on the break. But there was nothing they could do to prevent Kane breaking the deadlock with a quite brilliant effort from distance – his fifth goal in five games. John Marquis later sealed Rovers’ first win at home to Blackpool in 11 attempts with his 12th goal of the season. Victory saw Doncaster leapfrog Blackpool into seventh spot and extend their latest unbeaten sequence to four games. It was also their first clean sheet in 15 league games. Tom Anderson was recalled at the expense of Matty Blair in an attempt to counter the visitors' obvious physical prowess, which included giant striker Armand Gnanduillet. With confidence restored, following two wins and an excellent performance in Saturday's draw at Barnsley, there was an early zip about Rovers' play without testing visiting goalkeeper Mark Howard. It took ten minutes for Blackpool to highlight the home side's soft spot when a free kick caused panic in the Doncaster defence and then a long throw was allowed to reach Nathan Delfouneso but he failed to get enough power behind his shot. Rovers' first genuine attempt came midway through the first period when Ali Crawford's effort from distance deflected agonisingly wide. Blackpool, in their 3-5-2 formation, were doing a good job of frustrating the hosts while occasionally threatening on the break. One of those attacks, the result of a poor cross-field ball from James Coppinger, resulted in the best chance of the half for left wing back Joe Bunney but, after exchanging passes with Gnanduillet, he pulled his shot woefully wide with only Ian Lawlor to beat. Rovers had barely laid a glove on the Tangerines but in first half stoppage time Kane enhanced his growing reputation with a goal right out of the top drawer, unleashing a spectacular 30-yard piledriver which went in off the underside of the bar and via a hand from Howard. What made the goal even more special was that it was Kane who put a foot in and won the ball back in the build-up, before linking up nicely with Coppinger and letting fly in spectacular fashion. Danny Andrew might have done better with half a chance and Alfie May saw a shot on the turn deflected wide as Rovers went in search of a second following the re-start. Gnanduillet fired a snapshot wide at the other end but the points were wrapped up in the 78th minute when the ball dropped kindly for Marquis in the box and he expertly swept home left-footed. The goal completely took the sting out of the visitors. There was still time for Kane to smack the crossbar with a freekick but the Bristolian had to make do with just the one goal – a sensational strike that will live long in the memory. Rovers: Lawlor, Mason, Anderson, Butler, Andrew, Whiteman, Crawford (Rowe 61), Kane, Coppinger (Blair 71), May (Wilks 80), Marquis. Subs not used: Marosi, Amos, Cummings, Taylor. Blackpool: Howard, McLaughlin (Nottingham 61), Daniels, Heneghan, Tilt, Bunney (Taylor 76), Spearing, Pritchard (Dodoo 64), Thompson, Gnanduillet, Delfouneso. Subs not used: O’Connor, Boney, O’Sullivan, Feeney.